The velvet dinner jacket fits somewhere between a regular dinner jacket and a smoking jacket. Like the smoking jacket, the velvet dinner jacket is best worn for private events at home, particularly when one is the host. But unlike the smoking jacket it is also appropriate for intimate occasions at others’ homes or restaurants, and it can be worn out to creative black tie functions. 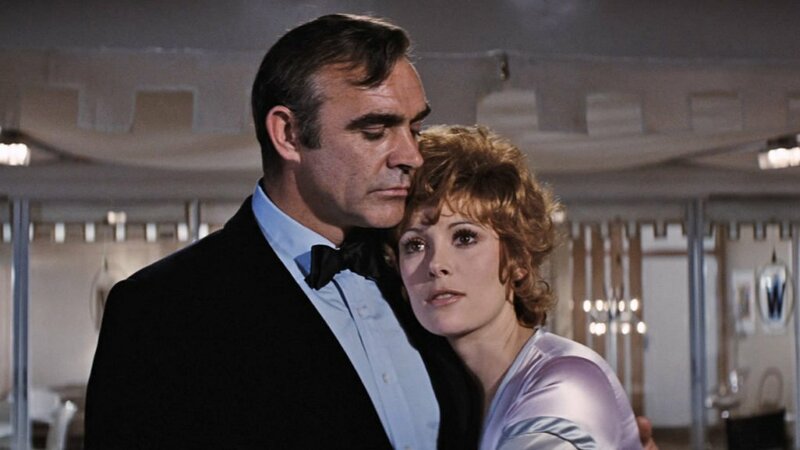 James Bond wears a navy velvet dinner jacket for a private dinner for two on a cruise ship in Diamonds Are Forever. The velvet dinner jacket is more of a cold-weather item and a somewhat odd choice to wear on a cruise ship, where the ivory dinner jacket is the quintessential garment. A creative warm-weather alternative like a navy dinner jacket in shantung silk rather than cotton velvet would have had the same effect but could have looked more fitting outdoors on a cruise ship. 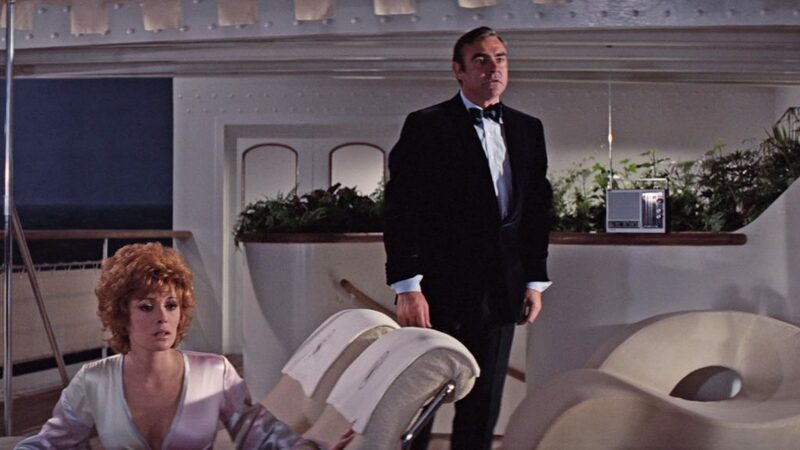 Nevertheless, the velvet dinner jacket is completely appropriate for this private dinner setting in Diamonds Are Forever. It’s made just like Anthony Sinclair’s regular jackets, with the same soft shoulders with roped sleeve heads. The details mostly same as the other dinner jackets in the film, with one button in a low stance on the front, double vents, four buttons on the cuffs and slanted pockets with flaps. 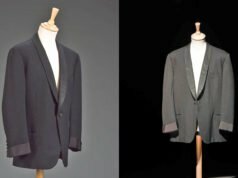 This dinner jacket revives the shawl collar from three of Sean Connery’s 1960s Bond films, and this is a self collar, meaning it is made in the navy velvet of the body of the dinner jacket. The buttons are also trimmed in matching velvet. 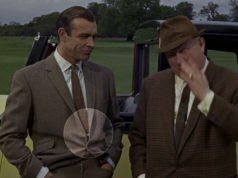 Unlike the wide lapels that Connery wears on his suits and jackets throughout Diamonds Are Forever, the shawl collar is narrow but has some belly at the bottom. The Anthony Sinclair trousers are standard black tie trousers, in midnight blue wool with a satin stripe down the legs. These are the same trousers that Bond wears with his ivory dinner jacket in Diamonds Are Forever. 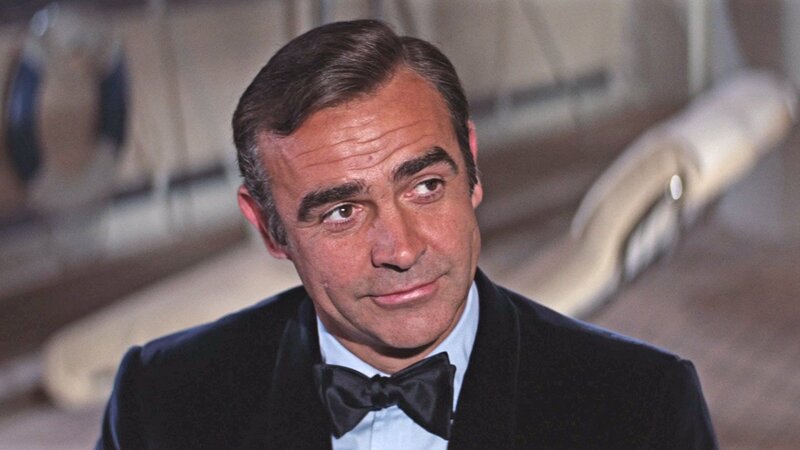 Bond also wears a standard black satin bow tie in a traditionally sized thistle shape, and the bow tie matches the satin trim on the trousers. Instead of a classic white dress shirt that Bond normally pairs with black tie shirt, he wears a pale blue shirt from Turnbull & Asser with a spread collar, narrow front placket and cocktail cuffs, made exactly the same way as his regular shirts. It does not have a pleated front, and thankfully it does not have the popular ruffled front of the era. The shirting is most likely something a bit more luxurious than standard cotton poplin, and it perhaps may be silk. The smooth drape and slight sheen of the shirt would suggest silk. A silk shirt would be a great pairing with a velvet dinner jacket, whilst also recalling Ian Fleming’s choice of dress shirt. 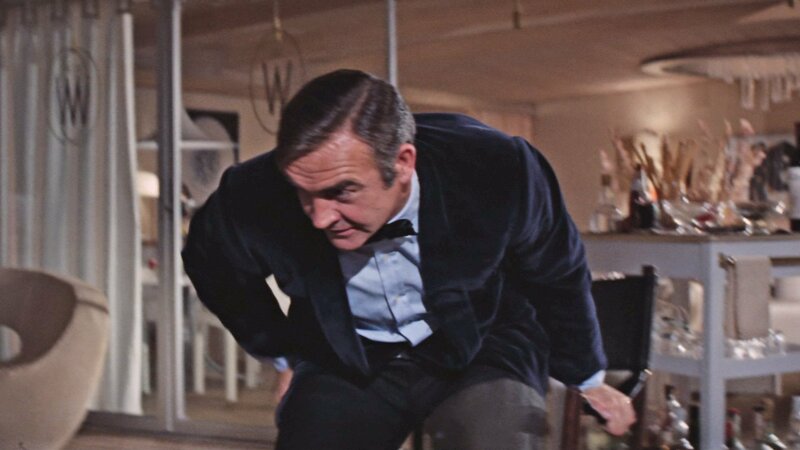 The shoes that Sean Connery wears with this velvet jacket are the three-eyelet full-brogue wing-tip derby shoes in black calf that he wears with some of his suits in Diamonds Are Forever. Despite having two other pairs of proper evening shoes in the film, he wears daytime shoes with this dinner jacket. This outfit is a great example of creative black tie that’s still very tasteful. The only thing that dates it to 1971 are Sean Connery’s sideburns. So a pale blue shirt is ok with this kind of dinner jacket? I thought the meaning with the smoking jacket was that you use it when slipping into something more casual after taking off the regular dinner jacket and that you hence only should use it with a regular white dinner shirt. I’m fine with the blue shirt here, even if it is a bit fashionable. You’re right about the purpose of a smoking jacket, but this is not exactly a smoking jacket. This is something you could wear to a “creative black tie” function or if you’re hosting a small black tie dinner in your home. This is surprisingly good. Like Matt wrote, it’s somewhere between the regular dinner jacket and the smoking jacket. And, speaking of smoking jackets, it reminds me of David Niven in the Casino Royale from the 60s. Smoking jackets are too flamboyant for today’s standards (and, perhaps, even for the 1960s), but they are very useful for someone who enjoys smoking cigars or pipes once in while. They keep you elegant without leaving your regular clothes smelling bad. Only the blue shirt is slightly 70s. But it’s quite a timeless outfit. A few years ago I was seeing velvet dinner jackets everywhere as a fashion piece. Isn’t the rather big-for-his-face bow tie a little 70s too ? Even if that could be more excessive. It’s a little big, but not compared not Roger Moore’s. It looks narrower than the other bow ties in the film. We’re so used to seeing the narrow batwing bow ties that a normal bow tie will look wider on him. Well, isn’t a classic thistle (or any kind of bowtie) size, like Brosnan’s ones, supposed to be as long as the distance between the eyes of the wearer, and not to hide -at least not entirely- the points of a spread collar shirt ? Sure, it’s a bit wider, but it’s not comically wide. At the end of the scene it looks like the bow tie is tied to be a bit narrower. Velvet jackets as a dinner jacket seem very popular right now. I saw several being worn to awards events on TV, such as the BAFTAs. There were even entire velvet suits, though that seems like too much to me. I’d pair one with the traditional white shirt, myself, though. 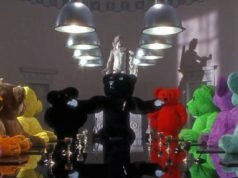 It’s funny that Roger Moore gets (simplistically) all the blame for both the tone of the Bond movies and the more flamboyant wardrobe of the 1970’s when it’s quite obvious that both trends started here with Connery in DAF (and arguably the latter facet with Lazenby in 1969). The contrast in texture is what makes it okay. Velvet jackets may be not very Bondian, but are very stylish. It’s a shame that Daniel Craig hasn’t worn one of the Tom Ford models with a nice and large shawl collar, and a correct fit. 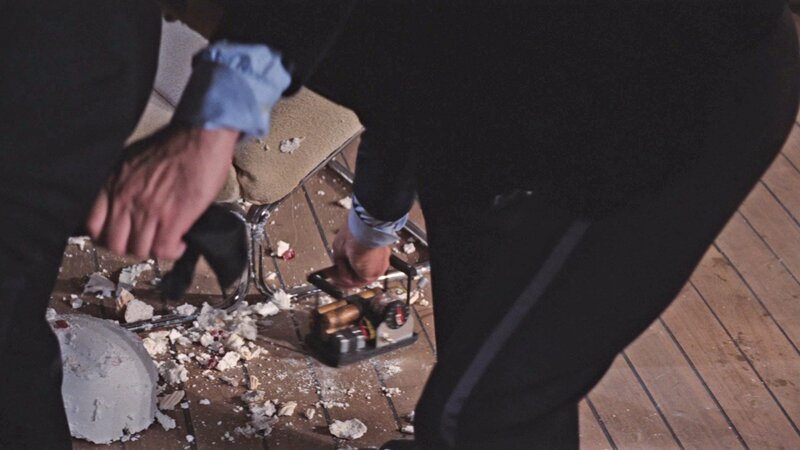 On the other side, I don’t remenber Bond wearing any smoking jacket, but I think that M is wearing one in OHMSS. I like this enough, which is surprising given my general dislike of all things Diamonds Are Forever (the song excepted). While I am not a fan of the velvet dinner jacket (which has been quite fashionable in recent years, albeit in a much trimmer cut), this somehow fits the 1971 edition of Sean Connery’s Bond, the dinner, and the movie. In the same kind of timeframe, and related to the characters featured in this blog, Roger Moore also wore a (I think it was black) velvet dinner jacket in some episodes of “The Persuaders” paired with a white ruffled front evening shirt whilst later in the decade Patrick MacNee’s John Steed character wore what looked like a dark green version with either a cream or white shirt (and like Connery’s here not an evening shirt) in episodes of the (largely awful) “New Avengers” TV series.